This ice-cool custom ride began as a classic 911 from the early 1980's with a clean record. Our goal for this project was to perfect its iconic looks and fine-tune its features for modern-day drivers. The exterior is a clash of opposing forces, classic and modern, light and dark. The original body with its fender flares and iconic lines was fitted with a modern drivetrain and classic Fuchs-style wheels. 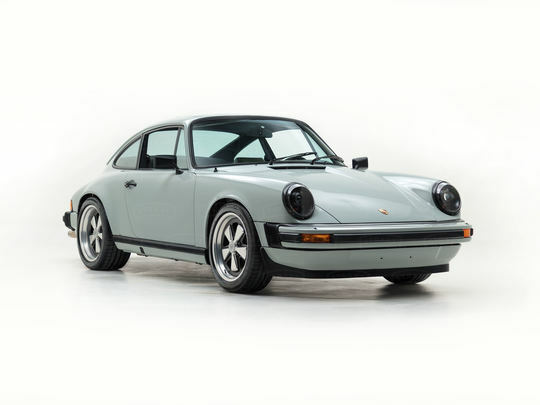 Blacked-out LED headlamps and exterior accents balance out the icy-cool, high-gloss finish of this classic 911, giving it a custom look influenced by the world of vintage racing. The 3.0-liter flat-six is one of Porsche's finest air-cooled engine, and this one gets an extra dose of power and efficiency with PMO electronic fuel injection that’s been sport-tuned by our experts. But power is not the reason to buy a 911. You buy it for that race car feel and unparalleled connection to the road. Here, that feeling is amplified by the 915 gearbox's spirited shifting, its sport-tuned coil-over suspension, sticky tires that grip every curve, and the big 930 brakes with plenty of stopping power. Light green leather, black interior accents, retro green gauges, and Porsche 356-style carpeting create a beautifully appointed cockpit seeped in 911 heritage. Among these vintage details lies a host of modern controls giving you access to your favorite playlists, premium sound, even turn-by-turn directions. If you'd like to see this car in person at our showroom in Miami, send us your inquiry below. We'd love to get you behind the wheel of this custom Porsche 911.